33030, 33051 Shakespeare Cliff & 33207 Earl Mountbatten of Burma pass through Kennett station on 10 August 1996 with the 33111 Charters 1Z20 12:10 Kensington Olympia to Kensington Olympia (via Cambridge, Ipswich and Chelmsford) 'Multiple Marauder' railtour. 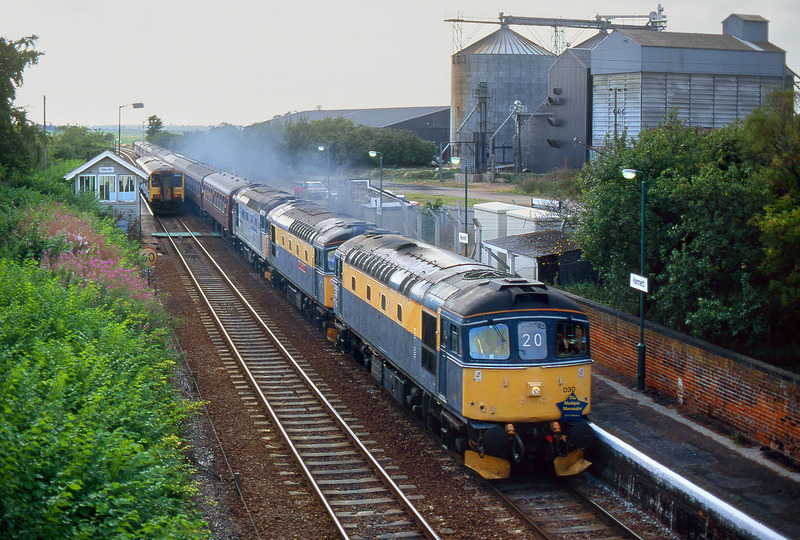 This was part of a tour which started from Preston, which earlier in the day, in keeping with the train's name, had been hauled by three Class 31s. Coincidentally, I have another picture of 33030 leading a triple headed train, and that wasn't even on a railtour!